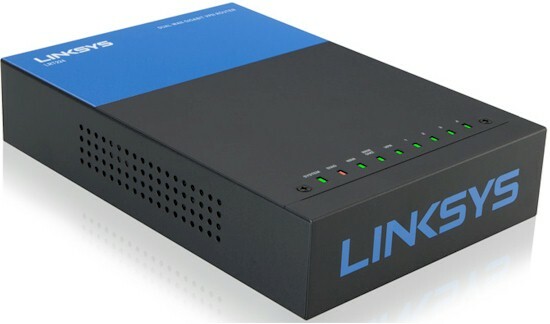 There are currently two routers in the Linksys product line for business, the LRT214 Gigabit VPN Router and LRT224 Dual WAN Gigabit VPN Router I am reviewing today. These two routers are identical in size, shape, number of ports, and internal components. Both routers have four LAN ports and two WAN ports. Functionality on both routers is nearly identical. The difference is the second WAN port on the LRT214 can only be used as a DMZ port, while the second WAN port on the LRT224 can be used as a DMZ port or WAN port. I reviewed the LRT214 in March 2014. Since that review, Linksys has updated the firmware for the LRT214 and LRT224 from v1.0.1.02 to v1.0.2.06. In this review on the LRT224, I'm going to cover some of the firmware updates, a bit more of the LRT214 and LRT224 functionality, as well as the LRT224's Dual WAN capability. The LRT2x4 are housed in a metal case measuring 5.25"W x 7.75"D x 1.75"H with an external power supply and rubber feet for desktop use. There are slots on the bottom panel for wall mounting. The device has no cooling fans, so it runs silently. The top of the LRT224, shown below, also has indicator LEDs near the front edge. As mentioned in my review of the LRT214, I like the VPN LED that indicates the status of the first Gateway-to-Gateway IPsec tunnel. However, I observed in my LRT214 review that the VPN LED would remain lit if the VPN Keep Alive feature was enabled, even if the tunnel was down. I was impressed to see this issue has been corrected on the LRT224 with firmware v1.0.2.06. The rear panel of the LRT224 has the Ethernet ports, shown below. The last port on the right for the LRT224 is a WAN/DMZ port, whereas the last port on the right for the LRT214 is a DMZ port only. The LRT214 and LRT224 share the same hardware. Below is a shot of the mainboard. Underneath the lower heatsink is a Cavium CN5020 CPU running at 300 MHz. The LRT2x4 have 32 MB of Flash memory and 128 MB of RAM. The Ethernet components include Broadcom BCM53125M and BCM54612 chips. The below is a highlight of the features listed on Linksys' LRT224 specifications page.